Manufacturer and Wholesaler of Passenger Elevators for Hotels. Our product range also comprises of Standard Passenger Elevators, Single Phase Home Elevators and Hydraulic Lifts. With the aid of our proficient professionals, we are able to provide an extensive array of Passenger Elevators for Hotels. The provided elevators are efficiently manufactured with the help of innovative methodology by our technical experts using high quality components. The provided elevators are mainly installed at hotels to carry heavy goods and passengers. 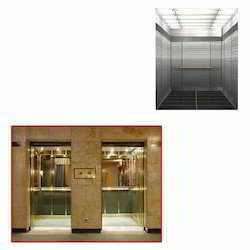 Moreover, these elevators can be purchased from us at competitive rates. Looking for Passenger Elevators for Hotels ?